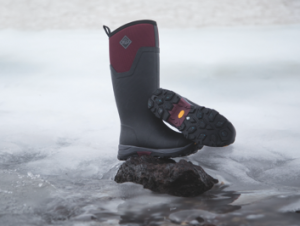 Premium outdoor boot brand, The Original Muck Boot Company is delighted to introduce the most advanced cold weather gripping system ever created. The new ground-­‐breaking sole technology by Vibram is specifically engineered and designed to perform on the wet ice, meaning the wearer can discover a whole new world of grip and performance. Each of the extreme conditions sports boots from Muck Boot feature a Vibram Arctic Grip Outsole allowing the wearer to rest easy even when walking on the iciest of pathways. Muck Boot know that the winter can be unpredictable, but believe that your footwear shouldn’t be. The collection features 5-­‐8mm of CR Flex-­‐Foam and a fleece lining all wrapped in a soft rubber outer layer, meaning your feet will stay warm and dry in even the most extreme temperatures. The Vibram Arctic Grip technology features a unique polymer blend coupled with an advanced filler system and new processing technique. This is then paired with the Vibram Icetrek, which yields the best grip on dry ice. Designed to be used in the coldest of conditions, the Arctic Grip offers performance, quality and durability at a temperature range of -­‐1°C to -­‐50°C. The collection features a soft fleece lining offering superior warmth and enhanced comfort, yet still durable to endure long cold treks and glacial environments. The new Arctic Grip range is available in two height variations (Tall and Mid) in both men’s, ranging from UK size 6 to 14 and women’s, ranging from a UK size 3 through to a 10. With a variety of colorways to choose from, the collection offers something for everyone.